Okay so the heatwave is over: We’re back to grey skies and only bursts of warm sunshine. And some rain. What we’d normally expect in June, in other words…! The abstract-pattern trousers I’m wearing today are a pair I’ve had my eye on for absolutely AGES (of course it being June it means summer sales, so hellooooo fantastic bargains). They’re from French Connection so were originally quite pricey at £80, but I saw they were reduced to just £24 and had my size… I’ll take one pair, thank you very much indeed (French Connection sales are always good). I think I’d held off because I have a lot of bold, patterned trousers – I didn’t exactly need a pair. But they’re cotton and have a tapered leg so are nice and voluminous round the bum and hip area… perfect for my large waist-to-hip ratio, and nice and cool for summer. And they’re just fun – what better reason is there?! Annoyingly I needed a jacket as the vest top just wasn’t enough to keep me warm, so I went with my white cutout jacket that I don’t wear all that often because the weather has to be just right for it. It’s scuba fabric so tends to keep you quite warm, but if there’s a chilly breeze you get cold because of all the holes in it (never satisfied, me). I got the jacket a couple of years ago from Asos, but if you’re looking for something similar French Connection has this one in the sale – a lot less than half price, too. I know some people shy away from wearing such a bold print, but if that’s you then just keep the other pieces simple and go for colour blocking. Picking out the colours in the pattern is always a good idea. Although my trousers didn’t have yellow in them it was a nice contrast to the red and purple, and the white jacket and black espadrilles complimented the black and white bits. Another quick mention for the espadrilles: I first wore these a few weeks ago (again when the weather wasn’t so nice!) – I talked about them being the perfect summer shoe to wear with flares. It seems they work just as well with tapered trousers, and they’ll probably suit every other trouser style as well. I have a feeling my espadrille collection is going to rise upwards from three rather rapidly this year…! 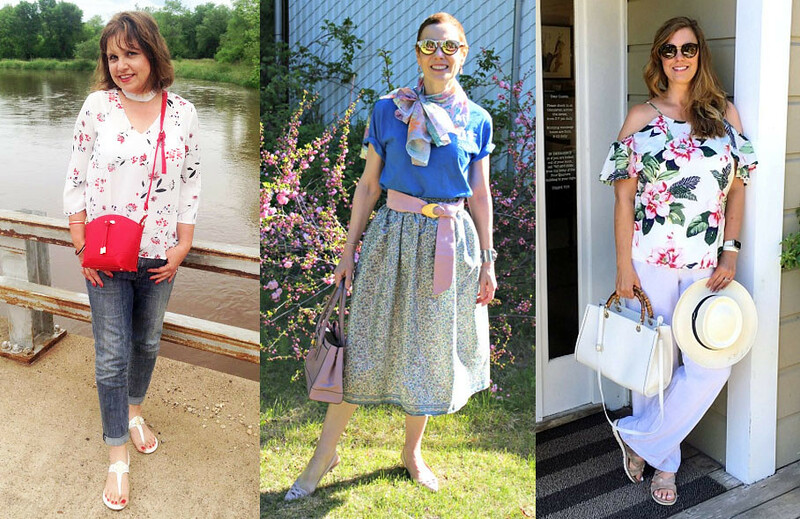 So do add your outfits to this week’s link up – and if you’ve added a link to here or my button to your post you may be featured next week! HOW BOLD DO YOU GO WITH YOUR TROUSER PATTERNS? COMMENT BELOW, OR TAKE IT TO TWITTER @NOTLAMB! This is outfit is so fun. You MUST be fun! 😉 I love your sassy, unique style. You can't go wrong with £24. They look super comfortable too. Scuba is a great fabric and even more so with the added extra of cut-outs. And surely the British weather is fickle enough to ensure you'll get a chance to wear many times over the summer don't you think Catherine. I love these bright trousers too and bet they're really comfy to boot. Thanks for the link up party. I saw that weather forecast too Catherine! "Aye, it's blowin a hoolie but tough it oot and wear those backless loafers anyhoo!" I love that scuba jacket and I'm sure with the right layers it could work for any weather. Aww, thanks so much for the feature! What a sweet surprise! I totally get what you're saying about the cool weather and the coat. We've had an unusual cold spell hit us as well and it has thrown me for a loop trying to figure out what to wear so that I'm warm, but not too warm. I wish summer would just get her and stay here. I LOVE that jacket by the way! I love the bold style! I so much the details on your jacket. It compliments the popping color of your pants. Oh and that espadrilles is everything. Thank you for hosting me. 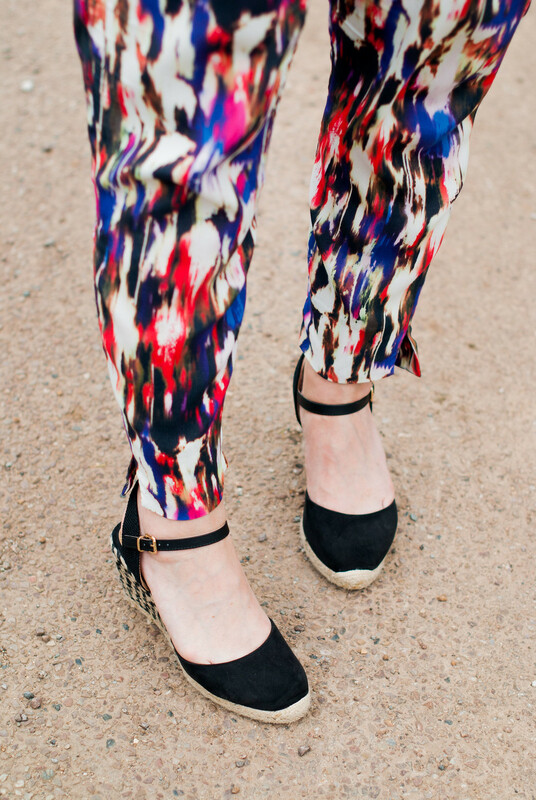 I Love colors & patterned pants and these are so Fabulous on you. Enjoy. .
Wow what a fun print! Those colors are definitely great for grey skies! Would love for you to join my new Monday style link up today! Why is it that so many interesting pieces are rather impractical – referring to your jacket with cutouts or, say, furry shorts. Heh. I'm glad the weather forecast called for this piece so specifically today. Hahaha! Fun outfit. Thanks for the linkup! I can't get enough of patterns. Love the jacket you paired with them! Thank you for hosting Catherine! Great pants! I love the bold pattern; I can see why you couldn't pass up the deal you got! The top, jacket & espandrilles look fabulous with them! Thanks for the linkup & Happy Monday! Thanks for featuring me. I feel so honored! Also thanks for putting this party together week after week. It's a lot of work! Have a nice week. I love a crazy pant and these are fabulous! I totally agree with you on keeping the rest of the outfit simple and in proportion. I really like the jacket you added, that is always a tricky part for me, and i love how yours came together! Those trousers are gorgeous! I've got a couple of pairs of loud print trousers but I think the wide legged variety suit my shape better. I usually team them with a plain vest top and although I'd love to wear a jacket, it's way too hot here at the moment! You look fabulous! Catherine, I love the tiny little pattern clash between the heels of your wedges and your bold pants! But that jacket is the show stopper for me! Fabulous! Inspiring post. Time to check out the patterned trousers in my collections! Thanks for hosting! Very lovely print, and you wear them beautifully. I love those pants! And I am a fan of the brand French Connection. I love how you styled the pants with the neutrals but wouldn't they be fun with bold colors too! Peace! You do patterns so well Catherine! Excellent price point on those trousers too. Thank you for hosting. Have a graat week! I have been loving print pants lately!! To me they are the best camouflage for the bottom half!